Despite having brains about 1/1000th the size of a human’s, pigeons can be trained to recognize and respond to cancer radiographs. As a new study from researchers at the University of California-Davis Medical Center reveals, this has potential far beyond sheer novelty and may be able to improve diagnostic testing for humans. The underlying concept is relatively straightforward. Pigeons are known to have good visual recall skills. An important part of cancer pathology is being able to look at a slide and determine if a mass looks like a tumor or not. Therefore, the researchers tested whether pigeons could be trained to recognize and respond to pictures of cancer slides taken from patients. A total of 16 pigeons were used in the experiments. The animals were trained to press a touch screen for a food pellet when the image of a malignant cancer slide was displayed. The slides were a mix of cancerous and non-cancerous cells taken from actual breast tissue. Over 15 days of training and 144 different slides, the pigeons were able to make the correct answer 85% of the time, with higher accuracy when the birds were tested in groups—what the study described as “flock sourcing”. This was the case even when the pigeons were shown images they had not seen before. One of the reasons breast tissue was used is because of the high amount of differences between patients when compared to other parts of the body. A heart, for instance, looks more or less the same in everyone but breast tissue will always appear different due to how fat density is arranged. Although the pigeons were able to meet or exceed the performance expected of a trained human medical student in many of the cases, they also showed consistent difficulties with certain kinds of slides. Much like human medical students, the pigeons had more difficulty properly identifying suspicious masses than straight cells. The more a slide moved away from a traditional cancer presentation, the trickier identification became. Researchers are hopeful that pigeons could become inexpensive substitutes for humans when performing medical imaging perception studies. These are important tools in developing diagnostic strategies since a large part of pathology is being able to analyze and assess various imaging results. The study observes that the pigeons would also “be able to explore a wide set of parameters and more cases could be considered than human observers would ever tolerate”. This is a delicate way of saying that the pigeons would not get bored as easily. The scientists also advise further research that looks at different levels of pixilation and other imaging changes along with direct human comparisons to assess their potential for further imaging research. 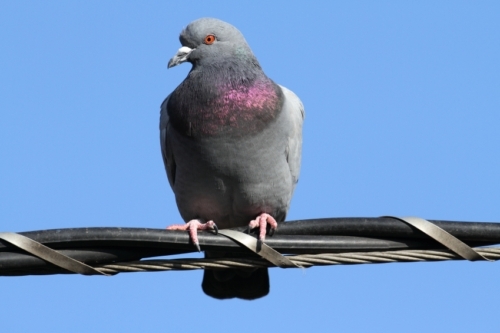 Christensen, J., “Pigeons, the next Great Cancer Detector?” CNN web site, last updated November 20, 2015; http://www.cnn.com/2015/11/19/health/pigeons-as-cancer-detectors/index.html, last accessed November 20, 2015. Levenson, R. M., et al., “Pigeons (Columba Livia) as Trainable Observers of Pathology and Radiology Breast Cancer Images,” PLoS ONE, 2015; doi:10.1371/journal.pone.0141357, http://journals.plos.org/plosone/article?id=10.1371/journal.pone.0141357.